There are few things more homey than fresh-baked bread. The smell slowly fills every room of the house, the warm slices melt in your mouth and the cold weather outside seems to disappear. Despite its deliciousness, even homemade bread isn’t something you should sit around eating by the slice. 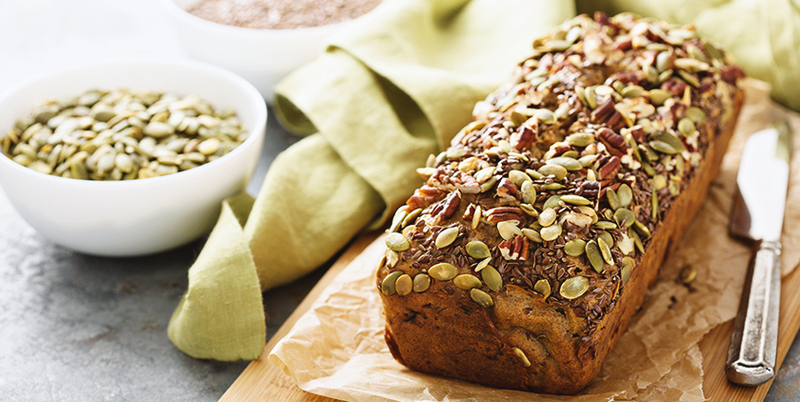 To make it more macro-friendly, we’ve added protein to this banana bread recipe. Eating carbs and protein together helps slow the uptake of glucose into your bloodstream, encouraging your body to use the nutrients rather than store them as fat. Blend all of the ingredients together, except the nuts. Once all other ingredients are combined, stir in the nuts. Pour mixture into a bread pan, ideally a silicone one. Bake approx. 40-45 minutes or until a knife inserted into the middle comes out clean. Slice banana bread to eat right away or set to cool. If saving for later, wrap in foil and store in the fridge. Remember, if you’re trying to build muscle, the best time to consume carbs is before and after your workout. Eating carbs before your workout helps you sustain energy, protect muscle mass and optimize recovery. They also help increase blood flow to your muscles during the workout for a greater pump. After your workout, carbs are either converted to fuel or stored in the muscle and liver as glycogen. Eating carbs at these specific times, when your body is ready to put them to use, can help you get leaner and stronger while performing at your best.